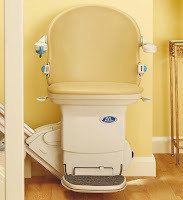 Castle Comfort Stairlifts offers top brand stairlifts, keen prices and fast installs for all those seeking stairlifts in Gretna Green and Lockerbie, Dumfries and Galloway . And all work comes with our no-quibble guarantees and famous customer service satisfaction. There are two small towns in Dumfries and Galloway worth mentioning because of course, Castle Comfort Stair Lifts supplies and installs stairlifts all over the county. In fact if you live in the area and are looking for advice, then we are the people to help. Castle Comfort Stairlifts is a family business that understands how important mobility and independence are to our older population. In the areas of Gretna and Lockerbie about 50 retired people already own stairlifts – we know because we keep count on our webpage. See our scrolling counter at the bottom of our home page. We supply stairlifts of all kinds to accommodate different staircases and needs. We have a range of straight, curved and platform stairlifts from all of the UK’s major manufacturers. We even have reconditioned ones if you’d prefer. We are happy to come out and assess what you need. Once you’ve taken the decision we can install within half a day and we provide an on-going 24/7 after sales service. If you’re interested or would like to know more, please give your local office a call on 0141 278 3929 . Gretna Green is historically the first village in Scotland across the border from England. This was certainly true when following the old coaching route which travelled from London to Edinburgh. Gretna is close by. Because of laxer marriage laws in Scotland, Gretna Green was the place where many English couples wishing to get married eloped. Now Gretna Green is as synonymous with weddings as Las Vegas! The affiliation with runaway marriages began as long ago as 1753 when an Act of Parliament known as Lord Hardwicke’s Marriage Act was passed in England. This act stated that both parties wishing to marry must be 21 and have parental consent. The Act didn’t apply in Scotland where the age that boys and girls could marry was 14 and 12 respectively! English couples who could not meet the English restraints, fled to Scotland and Gretna Green was the first place they came to across the border. As Scottish law allowed for what were known as ‘irregular marriages’ when a declaration made in front of two witnesses, anyone had the authority to conduct the ceremony. Popularly the Gretna Green Blacksmiths were often called on for this role and became known as ‘Anvil Priests’. Now marrying couples in Scotland must be 16 but still do not need the consent of their parents; in England 16 is also the legal age for marriage but parental consent is needed. Once couples turn 18 in England they too can marry without consent of their parents. Tens of thousands of weddings were undertaken at Gretna’s two blacksmiths’ shops and various other commercial buildings like inns and smallholdings. Today there are several dedicated venues including former churches and purpose built wedding chapels. All services are now conducted over an iconic anvil! About 5,000 marriage ceremonies are conducted here every year and like Vegas couples come from all over the world with guests in tow. Who’s married at Gretna Green? One celebrity who has managed to stay in the public eye had her second wedding there –ex Atomic Kitten Kerry Katona and taxi driver Mark Croft. £101 million lottery winners Dave and Angela Dawes were married in a ceremony at Gretna Green last year. In literature Wickham attempted to elope to Gretna Green with Elizabeth’s younger sister in Pride and Prejudice; in popular TV series a number of couples including Downton Abbey’s Lady Sybil Crawley and chauffeur Tom Branson who were stopped by Sybil’s sisters; characters in Eastenders, Coronation Street and Waterloo Road have also eloped to Gretna Green. Heading North West out of Gretna Green on the A74 you reach the town of Lockerbie some 16 miles further on. Lockerbie too has found unsought fame. This small town is known globally because of the ‘Lockerbie bombing’. The date 21 December in 1988 was when a Pan Am flight crashed after a bomb exploded on board. Eleven residents of Lockerbie were killed when the plane came down a further 259 on the plane also died. They came from 21 different countries. The flight was on course from Frankfurt via Heathrow Airport to JFK Airport in New York and onto Detroit. The plane was a Boeing 747 and the attack was order by Colonel Gaddafi during the Libyan Civil War. After years of investigation, al-Megrahi, an ex head of security for Libyan Arab Airlines was convicted of murder for the bombing of the Pan-Am flight. Serving a life sentence he was released on compassionate grounds in 2009 due to terminal prostrate cancer. He returned to Tripoli and died earlier this month (May 2012), three years after his release. The headquarters for the investigation of the bombing was conducted from Lockerbie’s Academy. Working with Syracuse University in New York who lost 35 students in the bombing, a scholarship has been set up from graduating students from Lockerbie Academy. Two outstanding students each year spend an academic year at Syracuse University before beginning their university education in the UK. Historically Lockerbie was a stopping point on the route from London to Glasgow; in the early 19th century a road was built from Carlisle to Glasgow running through Lockerbie. This was followed by a railway line some years later improving Lockerbie’s existing sheep trading potential across the border. A Georgian red-stone house, Lockerbie House is the most important historical building in Lockerbie probably because it owned most of the land and housing in the area. Built and owned by the Douglas family with the title Marquis of Queensbury. John Sholto Douglas founded the Amateur Athletics Club in 1866 and a year later the 12 rules of boxing matches were published and have always been known as ‘the Marquis of Queensbury Rules’. This sizeable house is set in 78 acres of land and has 40 bedrooms. The house is now owned by an outdoor pursuits company. Castle Comfort Stairlifts can’t boast a history as long as the Marquis of Queensburys, we’ve been in operation for a mere 15 years in comparison. But that’s long enough to know what a help a stairlift can be if you are finding your stairs a problem. A stairlift is a definite aid to safety too. 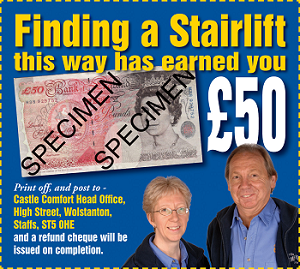 If you think a stairlift could be the answer to your prayers please take a look at our very fair price structure. If you need some assistance, there are grants available and of course 0% finance deals where obviously you pay no more than face value, but in instalments. We also offer you a £50 voucher (see above) which you can use towards your purchase – every little helps eh? If you are interested or still have questions, don’t hesitate to call us on 0141 278 3929 .